EEF, the manufacturers’ organisation, has launched a new training course to re-train and up-skill employees covering the knowledge and practical skills involved with robotic and automation engineering. This will make EEF one of the very few providers able to offer the training which will lead to the EAL Level 3 Certificate in Robotics and Automation. According to EEF there is a significant gap between where the workforce is now and where it needs to be. With employers installing robotics and automated systems in factories, there is an essential need to develop the right skills to work alongside this technology in a manufacturing environment. Employers will need a multi-skilled workforce able to adapt to these new systems and solve a wide range of issues that may arise in a day to day operation. The course is aimed at employees with existing knowledge in manufacturing, those who wish to learn about robotics and automation engineering, as well as technicians and engineers who wish to enhance their skills. Your comments/feedback may be edited prior to publishing. Not all entries will be published. Please view our Terms and Conditions before leaving a comment. Your comment will appear here. It is pending moderation by one of our editors. Ford’s Bridgend Engine Plant played host to the launch of the MADE (Manufacture for Advanced Engineering) project. Sign up for our newsletter and read the latest about manufacturing news, process and events! We promise we won't spam you! Manufacturing Management (MM) celebrates the best of UK manufacturing and the management teams who make our factories world-class. With 70 years of heritage as Works Management magazine, we aspire to help our readers realise growth in their sites’ productivity and profit through the content we provide in every issue. 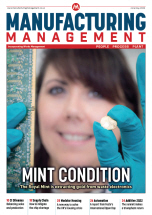 From lean management techniques to maintenance via the impending fourth industrial revolution, MM champions the cause of directors and managers in charge of the UK’s world-leading sites, offering them a wealth of best-practice ideas.